Hey. I’ve an offer for you. Invest today in an idea I expect to have fully fleshed out in the future, and I’ll pay you back with this virtual stock made up of unicorn farts and fairy wings. Oh, you can trust me because I’m wearing a fancy suit and have a firm handshake. In Lucy Prebble’s seemingly ambitious, mostly entertaining but ultimately superficial play, she makes the fall of Enron, one of the largest corporate scandals in history resulting in major updates to national compliance standards, seem as ludicrously simple as the above example. Particularly during one succinct little scene between Enron President Jeffrey Skilling (Bret Tuomi) and his soon-to-be CFO Andrew Fastow (Sean Fortunato) when they concoct a crazy accounting scheme — based on loopholes and lies — to protect Enron’s profitability. While I’m sure much more went on the boardrooms to create this hot box of corporate meltdown, you have to remind yourself that this is a play, and an entertaining one at that, so let’s not bother with accounting lessons when we’d rather focus our time seeing high-strung business executives sweat to keep a company, founded on arrogance and air, ridin’ high. Director Rachel Rockwell’s in-the-round staging aggressively bounces between boardroom, trading floor and, ultimately, prison. Tightly choreographed scene changes propel the action effectively. 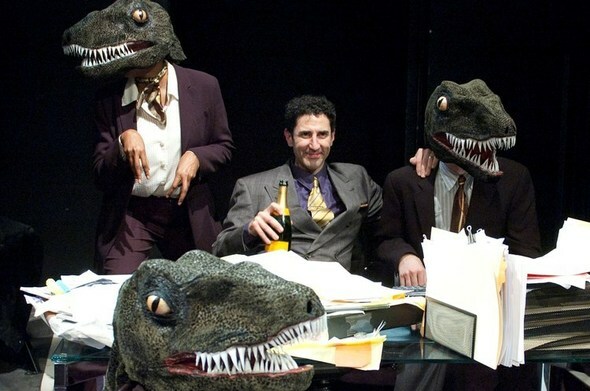 While the numerous visual metaphors are a bit obvious (Enron’s bumbling board members are personified by three blind mice; to represent Fastow’s book-cooking financial mechanisms, known as “raptors,” we get a group of business executives wearing, you guessed it, raptor masks), they bring a welcome absurdist element to the show. However, carnivorous reptiles aside, the scariest part of the entire thing, which Prebble’s barely touches on, is how such things happen in the first place. As Einstein said, “The world will not be destroyed by those who do evil, but by those who watch them without doing anything.” From the crowded intersection where a child gets run over by a van and no one stops to help, to the Abu Ghraib prison scandal, Enron is a symptom of a larger societal disease. And while Enron, the play, is an entertaining 2.5 hours, it’s mostly a missed opportunity.